The author of Infidel on the Paris massacre, memories of Theo Van Gogh, and why the Western media should reprint the Charlie Hebdo cartoons. God, I thought yesterday, how could this possibly happen? Charlie Hebdo is not new to this. They had reprinted the cartoons of Muhammad from 2006. They were under police protection for a good long time. They moved from their offices to new offices. So my first thought was, how could this even happen? How could the entire staff of Charlie Hebdo be gone—murdered in cold blood? And then came the memories. In Holland, when my friend Theo Van Gogh was killed just over 10 years ago, what followed—after the initial shock—was that a lot of people started saying that he was a provocateur, and that he had offended Muslims. For me, it was morally very clear. You were morally very confused if you thought that somebody who uses speech, who uses words, who uses the pen, should be killed for that; if you thought that the only way to have a dialogue is for one side to use words while the other side uses violence to make their point. Everyone out there who says, “Charlie Hebdo provoked,” is making the same fundamental error. We do need to wake up to the fact that there is a movement—a very lethal movement, very cruel—that has a political vision about how the world should be organized and how society should live. And in order for them to realize their vision, they are willing to use any means. They are willing to use violence. They are willing to use terror. Is this some kind of cult? Or are the principles of this cult embedded in Islam? I happen to think they are embedded in Islam. The only way peace-loving Muslims can get rid of this is by reforming their religion so that, for example, it can no longer provide justifications for murdering people deemed to be blasphemers. And while they go about reforming their religion, which will take some time, we who do not adhere to that religion need to defend our own values. Freedom of speech. Freedom of publication. And the rule of law. The questions going through my mind are: How on earth are there Kalashnikovs and rocket launchers in the heart of Paris? How did they get it in there? You think it’s only these three guys? There’s a whole network. There are a lot of people hiding weapons. When I was in Holland, this is the kind of thing people feared. The more we appease, the more we indulge, the more emboldened the enemies of freedom become. The ball is now in the court of the media. If the press responds to this by not reprinting the cartoons, by not defending the principle that Charlie Hebdo was defending, then we have given in. Then they have won. Those three men yelled, “Allahu Akbar.” They yelled, “The Prophet is avenged. Charlie Hebdo is dead.” Our duty is to keep Charlie Hebdo alive. Our duty is to make sure that they realize that the Prophet is not avenged. In 2006, when Jyllands-Posten in Denmark published the Muhammad cartoons, the mainstream media made the decision not to reprint those cartoons, to respect the sensibilities of Muslims and to avoid Muslim rage. This time it would be the biggest mistake for the Western press to repeat that—absolutely the biggest mistake. Obviously, the first obligation of all liberal democratic governments is to enforce the rule of law. The French government will hunt these murderers down. It must also break up the networks that lie behind them. And it must make sure that the platform of debate where we can freely exchange ideas is safe and sound. But the other thing that needs to be done is for us citizens to do. We need to stand up for free speech. This is who we are, these are our values. And yes, our values include tolerance of those who wish to make fun of religion. In the press, in the universities, in the schools, we have to make sure that Muslim immigrants who come to the West understand that our rules protect satirists from jihadists, and not the other way round. I’ve seen today the images of the sea of faces in European capitals holding placards saying “I am Charlie Hebdo.” That is beautiful and it’s the perfect thing to do. Tomorrow they should hold placards of the cartoons Charlie Hebdo had printed. Asserting our right to free speech is the only to ensure that 12 people did not die in vain. I would urge everyone in the media to take a stand now. An entire magazine has been wiped out. If you think they won’t one day come for you, too, just because you abstained from mocking the Prophet, then you are gravely mistaken. 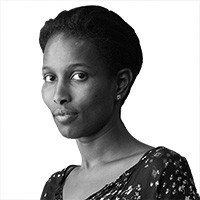 Ayaan Hirsi Ali is the founder of the AHA Foundation, a fellow at Harvard’s Kennedy School, and the author of Infidel (2007). Her latest book, Heretic: The Case for a Muslim Reformation, will be published in April by HarperCollins. As Told to Will O’Connor.